Here’s some broken train stations to celebrate placing first in the recent Bahnhöfe series on CrocoPuzzle. Rules Blacken one of each pair of identical numbers, then solve as a regular Bahnhöfe puzzle: Draw a loop that visits every cell (except the blackened stations), travelling vertically and horizontally. The loop crosses itself at the cells marked ‘+’, and can not touch itself otherwise. The loop goes straight through each (unblackened) number, and visits them in order. There’s an example on the wiki. This entry was posted in Puzzles and tagged bahnhöfe, kaputte bahnhöfe, medium, variant on 2014-10-23 by rob. Last of the set. This is a type that really benefitted from preparation, it takes some getting used to. The contest puzzle ended up going mostly smoothly, unfortunately I ended up spending a lot of time resolving a non-contradiction in one part of the puzzle. 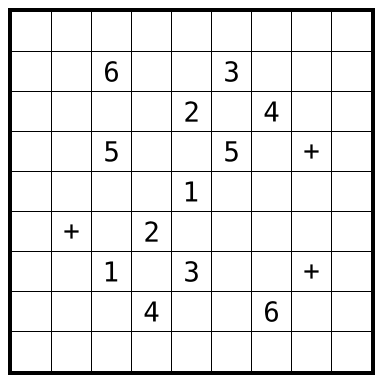 Rules Shade some cells to leave an orthogonally connected set of cells (the “cave”) that doesn’t enclose any shaded cells. All clues must be within the cave. Then draw a path through the cave that travels horizontally or vertically between cell centres that visits all unclued cave cells and doesn’t touch or intersect itself. This path passes through some (at least one) consecutive clues in ascending order, starting at 1 and going straight through any clue. 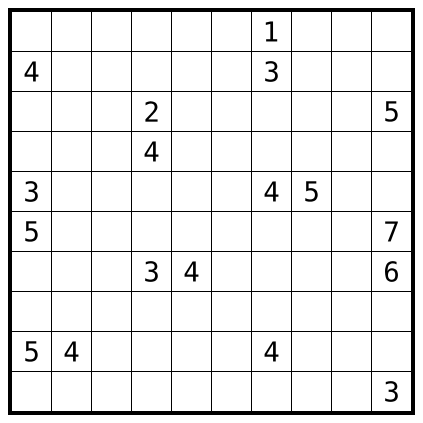 The clue 1 is in the second cell of the path, the highest clue as in the second-to-last cell of the path. The remaining clues are usual cave clues: they count the total number of cave cells that can be seen in horizontal or vertical direction from that cell, including the cell itself. See the puzzle wiki for German rules (that allow the usual Bahnhof crossings) with an example. This entry was posted in Puzzles and tagged bahnhöfe, cave, hard, höhlenbahnhöfe, variant on 2014-06-29 by rob. Saturday was the German Logic Masters in Stuttgart. I’m mostly happy with how it went, placing fifth after last year’s seventh in what was probably a stronger field. Though missing place four and thus the A-team for London by a single point is a bit hard. The puzzles were great, I particularly enjoyed the “special” rounds, such as the Doppelter Rundweg or the final Vier Jahreszeiten. They’re available now as online contests. I had a bit of time this year and made some puzzles in preparation that I’m going to post over the next couple of days. The first is a Sackbahnhöfe. 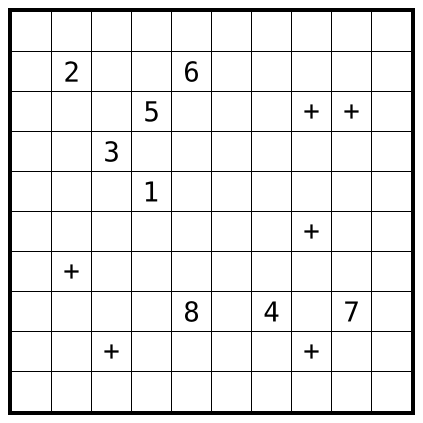 Rules (from the booklet) Draw a loop with some branches into the grid, which visits every field of the grid. The loop crosses itself only at the marked crossings. Fields with numbers are railway stations. The loop branches in the field before the railway station. There may be only one branch in a field. The branch then moves straight through the railway station, and ends in the field after it. The branches with the stations have to be in increasing order along the loop. See the contest page for instructions that include an example. This entry was posted in Puzzles and tagged bahnhöfe, medium, sackbahnhöfe, variant on 2014-06-23 by rob.